Britain has produced many pop stars, but in recent years none has been bigger than Robbie Williams. Take That were huge in the 1990s, which helped to launch Robbie’s solo career, which has gone from strength to strength in many parts of the globe – although, ironically, he can’t crack America, where he now lives. 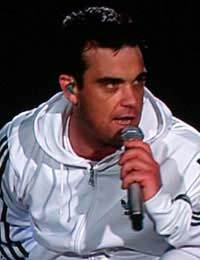 He might be successful beyond the wildest dreams of most people, but Robbie isn’t a happy man – on Valentine’s Day, 2007, his 33rd birthday, he checked himself into rehab to try and counter his ongoing depression. But the fans still love him. The question is…do the memorabilia collectors? Let’s be clear from the beginning – the people buying Robbie Williams memorabilia are the fans, not those looking at investments. The market is geared to satisfy them, not to look for the long term. What do fans want? Autographs are important – genuine autographs, for which they’re prepared to pay up to about £180, if they’re carefully presented, framed and matted with a picture and CD (one particularly good piece sold for £250). That’s something to hang on the wall, and the price isn’t too steep. An avid fan will be willing to part with that. However, with a few exceptions, that’s the high end of the line. Most of what you’ll find (and the vast majority is on eBay, with some items at dealers) is in the region of tickets (there’s a small demand for unused ones, but even they won’t cost you much more than £10-20). Curiously, people bid on old Take That posters and pictures, from when Robbie was still a member of the band, yet there seemed to be little demand for a Robbie Williams Take That doll, a piece of merchandise that one would have expected to attract a lot of attention. Even older tour tee shirts don’t attract that much attention in the £5-10 range. There are the inevitable record company promotional items, such as mugs, boxes of mints, radios – quite a list, including a radio/alarm clock – but again, they don’t really command premium prices, rarely edging over the £20 mark from dealers, although a promotional bag for I’ve Been Expecting You was on offer for £100. Older fan club packs will appeal to some collectors, if intact, and can bring in the range of £75. Likewise, a set of fan club postcards is something for collectors, even at £65. The biggest items you’re likely to encounter are the award discs, and these enter a grey area. With price tags running from £200-450 (the top end being for a BPI 6x platinum award for Greatest Hits), they’re generally a little beyond the pocket of all but the most avid fans – who tend to prefer autographed items, anyway. These are more for the serious collector – but are any of those interested in Robbie Williams’ memorabilia. At present, there’s little in the market to stir their interest, and that situation is unlikely to change over the next few years, barring unexpected events. It’s possible that, in time, Williams’ memorabilia will become truly collectable, but it’s far from certain. Anyone looking for investment would do better to look elsewhere.